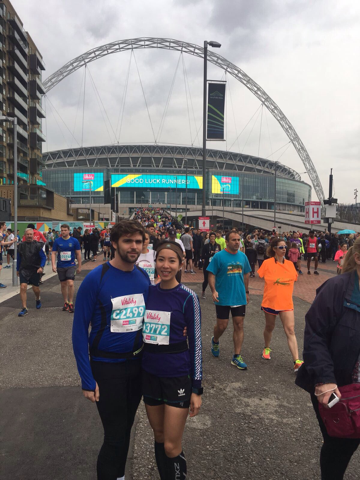 Last Sunday, Jess and I tackled the North London Half Marathon – the greatest finish line in the world. Wembley Stadium to the Allianz Stadium and back to Wembley for a stadium finish. Compared to the Brighton Half Marathon we did two weeks ago I think this was the clear winner: Water stations were more frequent, there were even more supporters AND the race T-shirt was included! Amazing! Perfect pacing! Feeling great!…. 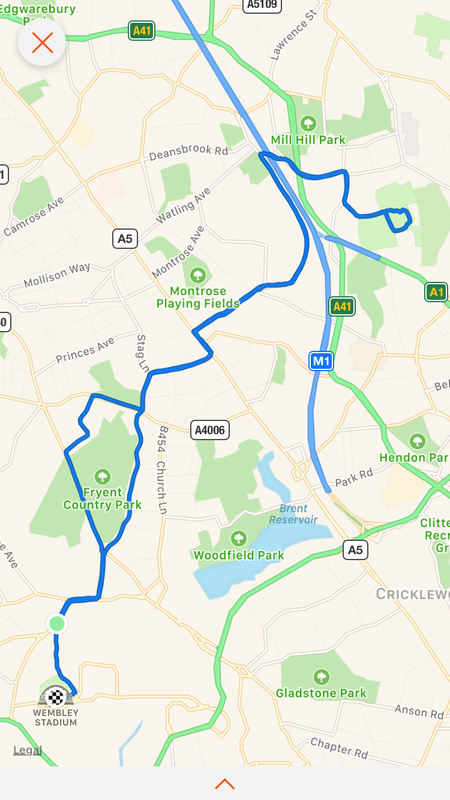 until exactly 7 miles in (my cursed mile) when I felt a sharp pain in my left calf- I faltered, thought about stopping, continued a few more steps, the pain got worse and then I stopped. Jess, who was setting the perfect pacing just ahead, rapidly disappeared. She did look back (this time) but I waved for her to go ahead and that was the last I saw of her until the finish line. I did manage to run some of the rest of the race – my calf felt like a tight knot with a sharp pain each step. Stretching helped a bit and for a few kilometres I alternated stretching for 30 seconds with hobbling a few minutes. Considering how painful that was and still is now a few days later I’m actually very happy with my time of 1h45. Improving from Brighton by 3 mins on a hillier course. And for me it was a North London Half PB! 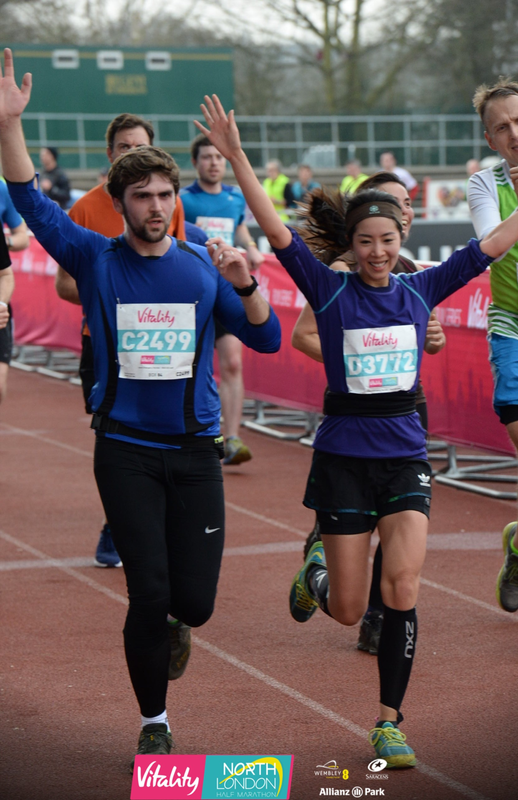 I ran this race for the first time in 2015 with a time of 1h53 (previously the route started and finished at the Allianz Statium). So what happened to my calf? If you’ve read my previous moaning about calf pain you’ll know previously it was my right calf. I’m wondering if I’ve subconsciously overcompensated for this injury and put more reliance on my left side. Since it’s now the left side that is swollen and painful. There was also a section of bouncy track at 6 miles that, thinking back, could be the culprit, but maybe I was pushing my luck anyway! My dad asked me after if I had any regrets about wearing zero drop shoes? Not really since I’ve either ran in fivefingers or zero drop for years. Although I’m sure this style does put more strain on the calves… I have been thinking about going back to fivefingers or more minimalist, but maybe my cure is actually some thick heel and more padding? Jess of course ran a great time 1h40! Proving the 1h38 in Brighton wasn’t just a fluke or accident. I’m very proud to have seen her journey from >2hr per half marathon to sub 1h40. She is truly a testament to the fact that hard work pays off! The countdown to the full marathon continues! Previous Previous post: Course PB at Hampstead Heath Parkrun!